WESTMINSTER, MD – SEPTEMBER 1, 2011 – Locally owned and operated for more than a decade, Jennifer Matthaei, Owner of You’ve Got it Made, recently announced she will be opening a second office in the western portion of Virginia by the end of summer. “We’ve been working with businesses in the Mid-Atlantic region for years. With the continuing growth in Virginia, we thought it would be an ideal location to open another office” stated Matthaei. “Our clients know we’re just a phone call away!” she said. You’ve Got it Made supplies companies with custom imprinted, unique ad specialties and promotional items to help them reach their marketing goals. WESTMINSTER, MD – November 4, 2010 You’ve Got It Made wins Carroll County Chamber of Commerce Small Business Award 2010. On November 4, 2010 at a ceremony held at The Portico of St. John in Westminster, owner Jennifer Matthaei was presented with a plaque by Chamber President Mike McMullin and Economic Development Director Larry Twele. 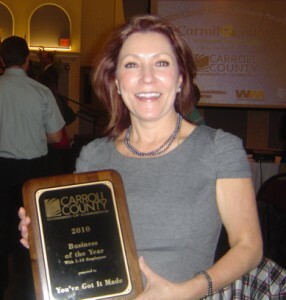 You’ve Got It Made was selected for the award for the company’s dedication to customer service, company longevity and growth, and service to the Carroll County community.